The Mint Julep, beloved libation of Southerners everywhere and the traditional drink of the Kentucky Derby, is now known as a bourbon based mint cocktail but this was not always the case. Up to modern times a Mint Julep could be made from brandy, rum or even genever (gin). Once served in a pewter cup* and now preferred in a silver julep cup, the Julep is a member of the smash cocktail family, cocktails that make use of a muddler for "smashing" ingredients in the bottom of a glass to release the aromatics and flavors. The metal cup allows for a nice icy frosting of condensation on the cup. As early as 1784 there are mentions of a medicinal treatment called a "mint julep" and the first mention in print came in 1803, where it was described as "a dram of spirituous liquor that has mint steeped in it, taken by Virginians [sic] of a morning." "Put into a tumbler about a dozen sprigs of the tender shoots of mint, upon them put a spoonful of white sugar, and equal proportions of peach and common brandy, so as to fill it up one-third, or perhaps a little less. Then take rasped or pounded ice, and fill up the tumbler. Epicures rub the lips of the tumbler with a piece of fresh pine-apple, and the tumbler itself is very often encrusted outside with stalactites of ice. As the ice melts, you drink." Though I flout tradition by adding pineapple, thanks to this little vintage tidbit my pineapple version is made an honest woman, so to speak. My other flouting of tradition is the use of an Old Fashioned (rocks) glass instead of the metal cup. I don't have a julep cup and I'm not buying a julep cup just to make Mint Juleps, my house is already full of enough drinking vehicles to open my own bar. So, okay, I don't use a julep cup, I went retro and added pineapple and I also fly in the face of tradition by using mint syrup and not muddling. Well, bless my little heart, I'm just a Northerner! If you don't mind a little sipping advice from a brash Yankee, try this recipe out. Chill your rocks glass. 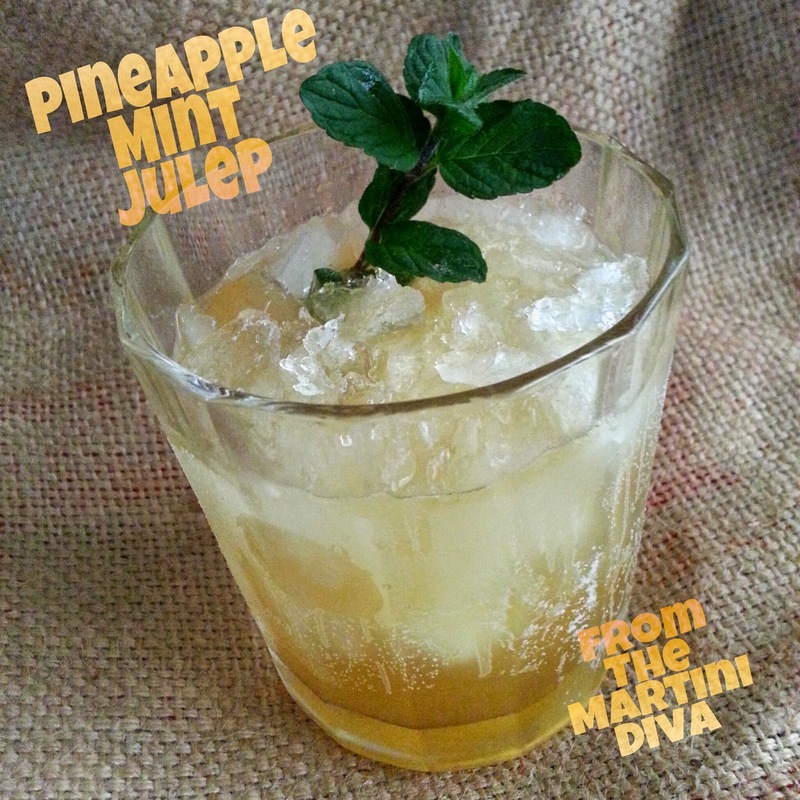 Pour in your bourbon, pineapple juice and mint simple syrup and stir. Fill the glass with chipped ice, stir a few more times, add the mint garnish and serve. 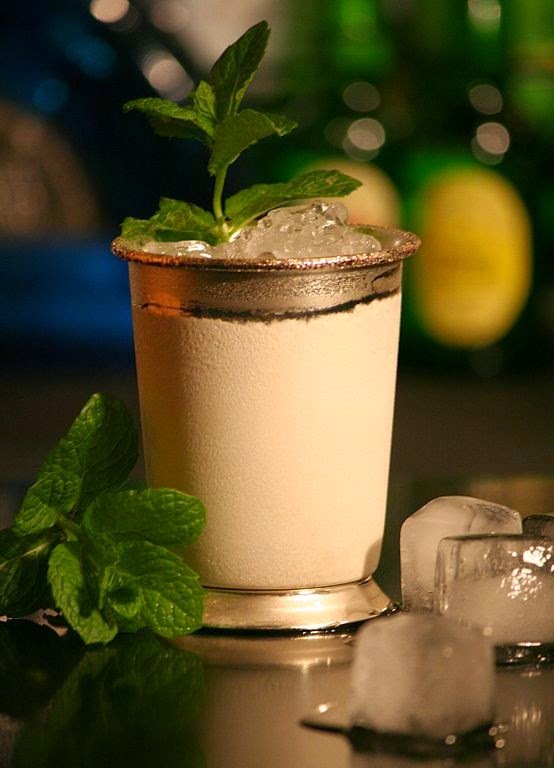 May 30th is Mint Julep Day. There are 165 calories in a standard Mint Julep. As well as being a fun alternative to the classic drink of the Kentucky Derby, this golden cocktail is great for Oscar parties or just sitting on your veranda in the summer heat jawing with Big Daddy. *The mention and use of a pewter cup should give clue to the age of this cocktail, as pewter, once standard for a tankard in colonial times, is now known to be toxic as a drinking vessel.